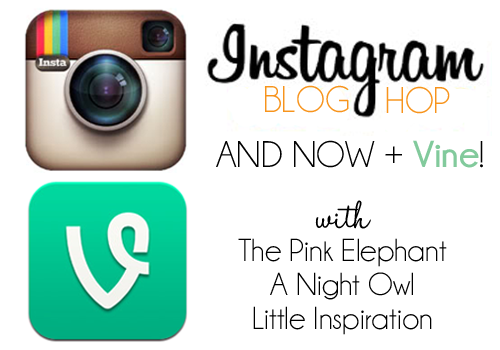 Welcome to the Instagram Blog Hop! If you’re new here, the Instagram Blog Hop is a party where you link up your Instagram account, find and follow new friends, and be continually inspired by what you see in your Instagram feed! No need to have a blog, just an Instagram account! Now you can link up your Vine account! What is Vine? It’s a new social media app by Twitter where you can share 6-second videos in the same way you share pictures on Instagram. That’s why we thought this was such a natural fit here! If you’d like a good overview of how to use Vine, check out this article: Twitter’s Vine App: How to Use It. If you’re interested in why as a blogger it might be a good idea to use Vine, check out this article: How Bloggers Can Use Twitter’s New Vine App! We think it will be a fun, new way to connect! 4. NEW! Link up your Vine Username and/or Video! Add your Vine username (so folks can find you) to the list below! Or link up a Vine video so we can see your cinematography at work! This is new, so there aren’t web profiles just yet, but hopefully they’ll be out soon! How do you find your video link? If you post your video on Facebook or Twitter, you will be given a URL that looks like this: “http://vine.co/v/bJegq22datT.” Just link that up below with your username so we can find you! If you don’t have a URL to one of your videos, simply link up your blog URL, but make sure the title is your Vine username so we can find you! 5. Check out and follow a few fellow Instagram or Vine friends. Post the button on your sidebar! Want to co-host? Email Kimberly to get on the calendar. Now let’s link up!